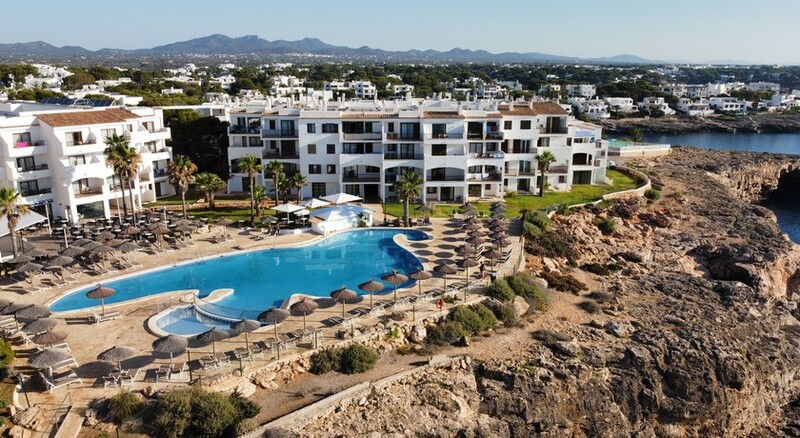 Located in Cala d’Or in Majorca, Roc Las Rocas Aparthotel is a complete 3-star accomodation, especially designed for family-friendly holidays. Warm, cosy and fully functional, this exclusive aparthotel is well-known for its superior services, multiple entertainment and eating options, and facilities for outdoor sports. The property enjoys a great seafront location and offers the perfect opportunity for a relaxing afternoon at the beach. Other facilities of the hotel include outdoor swimming pools, a golf course, a snacks bar and a souvenir shop for gifts for your near and dear ones. The property has 5 gorgeous apartments with one- and two-bedroom accomodation options. They are good for a small family of 5 people. Overall, Roc Las Rocas Aparthotel is the perfect choice for those looking for a budget option for their summer holidays. 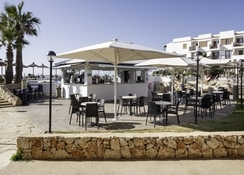 Roc Las Rocas Aparthotel is located at the beachfront of Cala d’ Or beach in Calle Forti in Majorca. There are a number of attractions nearby, including Mondrago Park, Porto Petro, Cala Figuera and Llombras. The nearest airport is Palma de Mallorca Airport, which is situated at a distance of 62.8 km from the hotel. The hotel is known for providing large, comfortable rooms facing the Mediterranean Sea. The hotel complex has 5 buildings in total with one- or two-bedroom apartments. They are perfect for a family of 5 members. They come with fully equipped kitchens, private bathrooms and terraces with astonishing views. Other facilities include in-room safe, refrigerator, toaster, kettle, tableware and electric hob. The main restaurant of the hotel serves a lavish buffet with a varied selection of dishes. The snack bar has a scrumptious selection of appetizers, which are sure to tingle your taste buds. 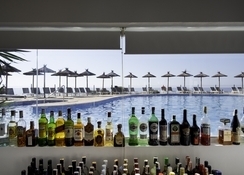 You can also enjoy a drink or two while sunbathing, thanks to wonderful swimming pool bar of the hotel. Roc Las Rocas Aparthotel has a number of great options to remain active. 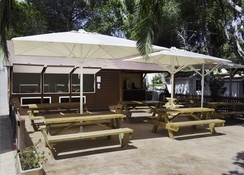 It has an open-air sports court with artificial grass, perfect for an outdoor game with your children. The games room has three pool tables and a table tennis court. Your little ones can make new friends from across the world at the Miniclub, while you can relax at the pool overlooking the Mediterranean Sea. Stay connected with the world with the free Wi-Fi facilities provided by the hotel, upon booking on their website. The lush gardens surrounding the pool area is the perfect place for an evening stroll.